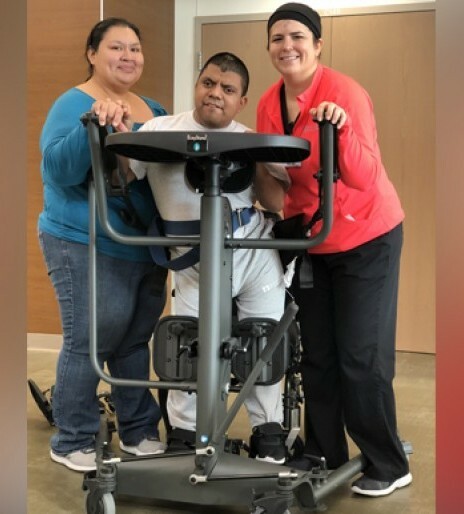 Tomas "Mossy" Casillas works to regain leg strength and balance with the help of Sarah Smith, PT. Denise Regalado, Mossy's mom, says the support and therapy he's received at Madonna during both recoveries are helping him regain his independence. “Tomas is a comedian. He’s feisty. I mean he’s quick, he can catch any joke you tell him. He’s ready for anything,” said Denise Regalado, Tomas' mom. In 1992, Tomas “Mossy” was hit by a drunk driver, resulting in a severe brain injury at age 3. He spent time recovering at Madonna’s Lincoln Campus, receiving intense therapy … and lots of love. "They showed him how to sit; they showed him how to stand. I learned everything by watching them teach Tomas,” said Denise. Thriving, 25-years later, he’s recovering from brain surgery for severe seizures. This time at Madonna’s Omaha Campus. “He’s always dragged his left side because he’s been partially paralyzed due to his accident when he was three. Now he is walking, picking his left foot up. That’s something we’ve never seen in 25-years,” said Denise. “Madonna’s a good place. For rehab, it’s a very good place. They work you to your—how you can go. They expect the best, but they’ll take you as far as you can go and beyond your limitations but they know how far beyond,” said Denise. Each patient's recovery from a brain injury is unique. Learn more by visiting Madonna's brain injury program.